T-Fal Actrifry 2 in 1 low fat fryer is the alternative to traditional deep frying you will appreciate. With so many other factors of modern lifestyle influencing our life, we don’t want our food to be one more. This multi-cooker offers frying without oil, which means that you don’t have to change your eating habits. Change the cooking technique. Read more about our selection of these best air fryers for home use. What Can I Cook In a T-Fal ActiFry? 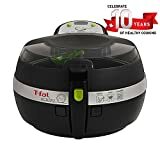 How Long Should I Cook French Fries in T-Fal ActiFry? What is the difference between Air Fryer and Deep Fryer ? Not only is it a healthier choice, but it is also much easier to fry using ActiFry air fryer. In comparison to traditional frying, T-Fal Airfryer multi-cooker does not require a lot of skill or time. In fact, all you need to do is add the food into your ActiFry air fryer and sprinkle some oil. Contrary to traditional frying, you don’t need excessive amount of oil to prepare your food. Not only is it healthier, but it also saves your money. ActiFry air fryer is also faster than your regular convection oven. The T-Fal Airfryer has a spatula which is in charge of even cooking. Therefore, you won’t have to check on your food as you would with your convection oven. Once you close the ActiFry air fryer lid, all you need to do is adjust only 2 simple settings. T-Fal Airfryer multi-cooker takes simplicity in cooking to another level. Set the ActiFry air fryer on, adjust the timer, and start the process. 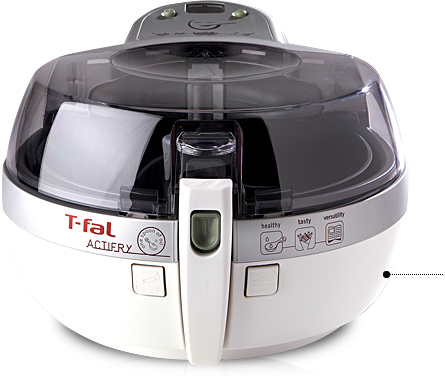 T-Fal Airfryer multi-cooker uses hot air instead of oil to fry French fries, chicken wings, or any other food. As the air circulates, the spatula regulates the cooking so you get an even result. T-Fal AirFryer is indeed different from other multi-cookers, and especially the deep fryers. There are many ways in which ActiFry beats the competition. In this section, we will discuss those T-Fal AirFryer features which make the ratings in reviews sky-rocket. If you’re not familiar with air frying technology, or air fryers for that matter, you could be skeptical. However, you should know that this technique dominates the culinary world. Not only is it convenient, but it is also a healthier and cheaper option. T-Fal AirFryer multi-cooker makes sweet potatoes, French fries and chicken wings which will taste just like the deep-fried ones. The secret is in hot air circulation. With just a tablespoon of oil, you’ll get superior taste with fewer calories. As the air circulates, the food processing takes place outside and inside the ingredients. The outside remains crispy, especially with French fries and chicken wings. The inside, on the other hand, is soft and juicy. In addition to the hot air technology, T-Fal AirFryer has a spatula which makes sure that the cooking is even. There is no reason to give up your favorite dishes, such as sweet potatoes and French fries. Your buffalo style chicken wings can be just as delicious if you use ActiFry air fryer. According to numerous customer reviews, the taste difference is minor. Some reviews even emphasize the superior taste of the air fryer meals. With ActiFry air fryer, all it takes is a tablespoon of oil. The air fryer processes the food evenly, and always successfully. The timer makes it easy for you to determine the cooking duration. This way, you won’t end up with overcooked chicken wings or sweet potatoes ever again. Using hot air instead of an excessive amount of oil to fry makes the process as healthy as it can be. As mentioned before, ActiFry has only two settings: the on/off one, and the timer. Once you place the food into your ActiFry, sprinkle a tablespoon of oil onto it. Once the timer is set, there isn’t anything else you need to do. The timer alarm notifies once the process is complete. No oil splatter, no burns, no mess, and no overcooking. Not only is ActiFry easy to use – it is also easy to clean. First and foremost, all ActiFry parts are removable, and therefore easy to keep neat. The lid, paddle spoon, filter, as well as the pan, are dishwasher-safe. You can easily wipe the remaining parts of the device with a sponge, or a cloth. Traditional frying pans tend to get sticky and almost impossible to clean without ruining the surface. This is not the case with the ActiFry removable pan. It has a ceramic coat which is non-stick. The ActiFry air fryer dimensions are as follows: 19.1 x 11.8 x 15.6 inches. This device will not take any more space on your kitchen counter than any other regular kitchen appliance. As for the device weight, it weighs 10.9 pounds. The air fryer uses only a tablespoon (or even less) oil to fry your food. What’s great about it is that your options aren’t limited. Try making different dishes, varying from fries and wings, to seafood and desserts. The possibilities are indeed limitless. As for the favorite amongst all fried dishes – French fries, you can fry up to 2 pounds in one session. The capacity of the air fryer is 2.2 pounds, which is approximately 4 servings. The device saves your time since it doesn’t require any pre-heating. The controls are incredibly simple: there is a timer, and a power switch. The digital timer comes with a buzzer which notifies you when the cooking is complete. Also, the lid is see-through and steam-free, so you can monitor the process. For just the right amount of oil and no oil wasting, there is a precise measuring spoon in addition. The Skinny ActiFry Cookbook is a healthy cooking guide which can help you use your air fryer to its full capacity. This cookbook introduces many delicious and healthy T-Fal Actifry recipes you can easily follow and execute. T-Fal ActiFry Snack Grill is a game-changer when it comes to healthy snacks. Not only can you make your favorite meals healthier, but your snacks, as well. We all know that snacks are usually the worst choice for our health. However, which this Snack Grill, you can make potato chips, or any other healthy snacks. It comes in two sizes and capacities: there’s the 1-kilogram, and the 1.2 kilogram model available. As for the warranty, you should know that there are separate ones for the product itself, and for the accessories. Also, T-Fal website offers a list of countries in which the warranty is active. In a majority of countries, the warranty period is 2 years. However, there are certain states which have only a 1-year-long warranty. It is more than obvious that T-Fal AirFryer is a versatile device which can produce many different dishes. Its versatility goes beyond dishes such as fries and sweet potatoes. To exemplify its possibilities, here are some healthy T-Fal airfryer recipes which you can make yourself using your ActiFry. 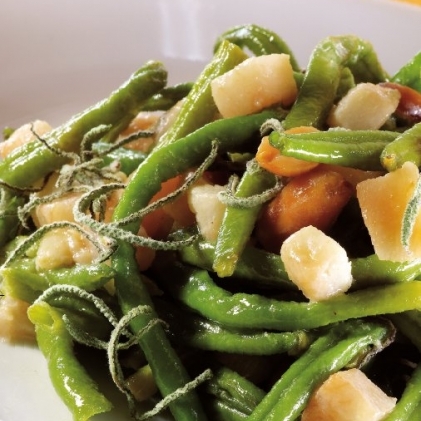 Take the green beans and cut them lengthwise, cutting off the ends. Add a spoon of oil on top of the beans and sage and cook for 10 minutes. After 10 minutes, add the peanuts, as well as the pear. Add the stock and the cream and cook all together for 10 minutes. Prepare the Brussel sprouts for cooking by chopping off an inch from the bottom of each. Also, remove the outer leaves. Cut the core into four pieces. Cook the diced bacon for 7 minutes, and then add the brussels. Add the remaining brussel leaves and water. Cook this for 7 minutes. Add the oil, as well as the lemon juice and the seasonings once you serve the salad. Make a mixture by adding the chicken, sage, seasonings and Worcestershire sauce. Leave it aside. Add the squash into your air fryer along with the oil. Cook for 7 minutes before adding the onions, and then cook for 5 minutes more. Add the chicken mixture and mix it all up. Cook for 5 minutes. To conclude this review, we offer you the answers to some of the questions which the customers often discuss. As many customer reviews state, T-Fal ActiFry is equally as good in making simple dishes, as well as the more challenging ones. The most popular dishes are definitely French fries, chicken wings, and sweet potatoes. But also, you’ll be able to cook other vegetables, all kinds of meat, as well as seafood. You can make stews, sauces, and even desserts. To make great French fries in ActiFry, wash and cut the potatoes trying to make fries similar in size and shape. Dry them and add them into the unit. If you’re using fresh potatoes, cooking will take 30-35 minutes. The cooking time depends on your preference regarding crunchiness. Frozen French fries will cook in 20-25 minutes. Check our article on deep fryer vs. air fryer: Which Is Best? T-Fal ActiFry Low-Fat Airfryer is the way to go if you don’t want to ditch your favorite dishes, but you care about your health. Healthy cooking can be fun, and you can find a healthy way to your favorite snacks.If you want to cook with less oil, air frying is the technique which will become your favorite in no time. Give air frying a shot, and do so with this T-Fal’s healthy alternative to traditional deep frying. And l﻿﻿et us kn﻿﻿ow of course!